UPDATE (July 2015): For those interested in ordering the books but living outside of Korea, we recommend the specialists at HanBooks.com. 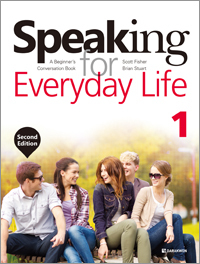 ESL textbooks designed specifically for Korean university students and other adult English learners – no more boring your students with a book aimed at some mythical ‘world student’; the poorly-named ‘Speaking for Everyday Life’ ESL books specifically target the interests and needs of Korean students. The second edition books follow the same structure as the popular originals (no need to upend your syllabus), but with updated dialogs, images, and themes. Click here for more information from our publisher, Darakwon, in English and Korean, including prices, a sample chapter, and ordering information. This book was co-written by the owner of this website. When will North Korea collapse? Plenty of Korea specialists have taken a stab at this parlor game of predicting Pyongyang’s fall: Foster-Carter, per above; Victor Cha, current Georgetown professor and former Director for Asian Affairs at the NSC in his 2012 book; economic specialists (e.g. Haggard and Noland). Intelligence analysts and foreign policy specialists have filled entire servers (and before that, file cabinets) with studies on when the North will collapse. Here’s one from the CIA circa 1997/98 (also here) that featured a majority of Korea specialists convened by Langley doubting the regime could last another five years (we’re coming up on 20). Not to begrudge anyone their game, but what’s the point? [Book Review] Lankov is one of the world’s top North Korea specialists, publishing in English or Korean, and has the rare benefit of speaking the language and having spent time studying in the North. While getting time on the ground in North Korea can be difficult, too few ‘experts’ have spent much time in either of the Koreas, or even bothered to learn the language – problems readily apparent when talking to many U.S. military, intel agency, or other denizens of government assigned to Korea issues. Given 60+ years of failure to achieve U.S. goals when it comes to the North, maybe it’s time to try learning from folks like Lankov. “The North Korean leaders do not want reforms [AKA more trade/interaction with the outside world, as the U.S. State Dept. is forever trying to foster] because they realize that in the specific conditions produced by the division of their country, such reforms are potentially destabilizing and, if judged from the ruling elite’s point of view, constitute the surest way of political (and, perhaps, physical) suicide.” [Hardcover edition, pg. 112]. The North Korean elite “would be happy to see a North Korean economic boom – as long as they are not going to enjoy this wonderful picture through the window gate of their cell.” [Pg. 118]. In 2012, Iran and North Korea signed a framework agreement on technology sharing that formalized ongoing IT, nuclear, and other tech-related cooperative development efforts. This cooperation has increased Iran’s cyber capabilities, exhibited most clearly by an October 2012 cyber attack on Saudi Arabia’s Aramco Oil. By 2013, experts had begun to note technical and tactical similarities in attacks separately attributed to Iran and North Korea, including a series of disruptive attacks that led major U.S. banks to request help from the NSA. Related writings on Iranian attacks can be found here. The McAfee report does not explicitly blame any particular country for the attacks, but makes the case that the attacks have been conducted by the same organization, taking the same measures against the same sites in an ongoing, state-level espionage operation. Investigating the same incidents separately, the South has laid official blame for the attacks on the North. If the South’s researchers haven’t already figured out what’s in the McAfee report, its findings will likely play a role in relations between the two Koreas very shortly. UPDATE (10 April): The South made its preliminary case today that a North Korean espionage agency was behind the 20 March cyber attacks. According to the South’s report, the North began preparing for the attack last June, with systems testing beginning in late February. Of the 76 types of malicious code used in the attack, 30 were similar to previous attacks by the North, and 22 of 49 IP addresses overlapped with previous addresses used during cyber attacks traced to the North since 2009. UPDATE (22 March): The South’s communications commission issued an update today declaring the cyber attack started from an IP address at a domestic bank (Nonghyup), not a Chinese address, as they reported yesterday. Meaning, aside from an irritated China and embarrassed Korean bureaucrats, that the attack erupted from a domestic source. How the code was placed on that server, by whom, and how it spread is still under investigation – an investigation likely to be much more circumspect in placing blame during future announcements. On another note, perhaps the biggest news from the peninsula this week, submerged under the flood of reporting on the cyber attack, was a report that China’s oil exports to North Korea fell to zero in February. Perhaps a sign that the Chinese are getting fed up with the North’s missile and nuke testing – China normally sends 30-50,000 tons of oil to the North per month, an official figure that hasn’t gone to zero since 2007. If this continues through March, we may see a sudden change in the North’s tone, at least long enough for the Chinese to restart the spigots. Frankly, China shutting down its supply of oil to the North for two straight months would surprise me more than a semi-crazy member of the Bad Boys getting invited to Pyongyang to drink with the head Kim, but hey, stranger things have happened. UPDATE (3 April): The North closed entry to Kaesong today for South Koreans, but allowed those present in the complex to either remain in the North or head home to the South. Citing business and production concerns, only 33 of 446 South Korean workers in the complex actually came South, with the rest remaining behind to tend to their work or business interests. Posing the somewhat interesting question – given a choice, would you elect to stay in North Korea right now for your employer or business? Previous closures have been short-lived, with few repercussions for those remaining behind, those who left, or the businesses located in the zone. Time will tell if this closure ends the same. Either way however, today’s closure signals a further heightening of tensions and worsening of inter-Korean relations. UPDATE (1 April): The North actually threatened to close the Kaesong complex over the weekend, but most doubt they will follow through on the threat. If the North’s leadership is under the illusion that shutting the facility will hurt the South worse than the North they might be tempted, but short of that level of cluelessness, the North is unlikely to close such a prime hard currency source. UPDATE (28 March): Reuters catching on to the idea of Kaesong as an indicator of the true level of tension on the Korean peninsula: Despite threats, North Korea keeps border factories open. Every time tensions rise on the Korean peninsula, people start asking what’s going to happen next. Is there going to be a war? Will tensions cool? Will the North conduct an additional rocket or nuke test? Will there be another cyberattack or similar provocation? While no one outside of the North’s inner circle (now including Dennis Rodman?) can say for sure, there are a few indicators. One I’ve discussed before is the status of the joint North-South economic development zone in Kaesong, just north of the DMZ. If the North suddenly closes the zone, or takes as hostages any South Koreans remaining in the zone, then that’s obviously not a good sign. Similarly, if the South orders its people out of Kaesong and forbids more to enter, that’s an indicator the South is expecting the situation to worsen, or is planning a response to a Northern provocation. South Korea’s president mentioned her concern about the North taking hostages at a meeting just this morning, indicating high-level concern over the issue in the South, but no plans to recall its citizens. Other indicators, aside from updated imagery showing North Korean troop movements, include the North shutting down or greatly restricting access to its relatively new domestic cellphone service. I also detailed this indictor previously, calling any curtailment in service a sign the North was cracking down on or attempting to prevent internal dissent, or was suddenly concerned about a new threat. More stories about South Korean military and defense officials spending their time playing golf instead of monitoring developments indicate the South’s level of concern over a possible provocation. While reports of more North Korean deserters, especially among frontline troops near the DMZ, show both military weariness and loss of capability for a conventional strike in the North. Finally, the South raised its ‘cyber alert level’ on 12 February in response to North Korea’s most recent nuclear test. A further increase, or reduction, in this level is also a sign of where the South believes the situation is heading. Hopefully, amid all of the fuss, bluff, and thunder on the peninsula, these indicators prove useful for predicting the course of future events in Korea, whether war, nothing more than talk, a conventional Northern provocation, or another Northern cyberattack on the South. “The present Libyan crisis teaches the international community a serious lesson. It was fully exposed before the world that ‘Libya’s nuclear dismantlement’ much touted by the U.S. in the past turned out to be a mode of aggression whereby the latter coaxed the former […] to disarm itself and then swallowed it up by force. It proved once again the truth of history that peace can be preserved only when one builds up one’s own strength.” [KCNA website, 24 March 2011]. The idea that additional UN sanctions, much discussed in today’s reporting, will push North Korea from this path is delusory. This is a country that is already one of the most sanctioned on earth and operates under an ideology of self-reliance so stringent it views international trade as a weakness. Expecting anything different from additional sanctions brings to mind the old saw about doing the same thing over and over again and expecting a different result. [Book Review] I’m glad someone finally went to the trouble of researching and writing a book on the network, for obvious reasons quite secretive, which works to get North Korean defectors through China and into safety in South Korea or elsewhere. You might ask why North Korean refugees aren’t safe once they reach China, given that China is obliged to protect the refugees by virtue of agreeing to international treaties including the 1951 Convention Relating to the Status of Refugees and the International Covenant on Civil and Political Rights (which includes The Universal Declaration of Human Rights). Unfortunately, at least in this case, China’s government pays about as much heed to international treaties as America’s Tea Party. Instead of upholding its treaty obligations, it actively tracks, arrests, and returns the refugees to the North, where they and their families face sentencing to one of the North’s infamous gulags. Those caught helping North Korean refugees in China face, at best, expulsion from the country, at worst, years in a Chinese prison. Given these conditions, Kirkpatrick’s choice of subtitles, “The untold story of Asia’s underground railroad,” becomes more apt. Though the book’s comparisons to the slave-era American underground railroad are occasionally jarring, suddenly transporting the reader from modern Asia to 1800s America, they serve to highlight the similar dangers faced by everyone involved. South accuses North of cyberattacks; Pyongyang relying less on spies, more on cyber? 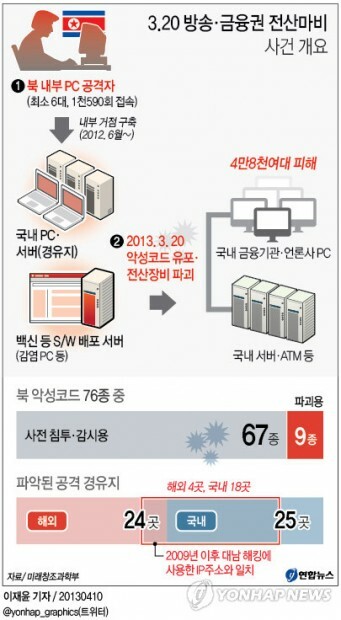 The South officially accused the North today of launching a cyberattack against the JoongAng Ilbo, a conservative daily in the South. More interesting is what the South’s investigation also discovered – since 2009, the North’s cyber attacks on the South (targeting banks, elections, universities, and other organizations) have used the same China-based IP address owned by North Korea’s Ministry of Post and Telecommunications.